FreeFrom Eating Out Awards 2017 Revealed…. Where’s your nearest? As one of the Judges for the FreeFrom Eating Out Awards, I am able to discover new eateries across the UK and in some cases, visit them to see how they measure up to their promises! It is always a joy to find a good, reliable and safe eating out venue: whether it is in a large city (such as my home: London) as well as in smaller towns and villages whilst out and about. The FreeFrom Eating Out Awards exist to encourage innovation and celebrate FreeFrom excellence in the food service industry. The awards seek out the best ‘FreeFrom’ eateries from beach hut cafés to five star restaurants – and then send out their expert judges. Based on the judges’ reports, gold, silver and bronze awards are made to eateries who understood how to cater safely for food allergic people. But, as important, awards go to those who have learned how to provide guests on restricted diets with exciting, innovative and delicious food which can rival, if not excel, their ‘normal’ offer. The awards are run by the FoodsMatter team who have, for the last ten years, run the hugely successful FreeFrom Food Awards, the FreeFrom Skincare Awards and FoodsMatter, a massive allergy information resource site with over 1 million unique users a year. The first step for all participating venues is a comprehensive written submission detailing their staff training, kitchen and serving practices and menu. The submission includes key questions which test knowledge of allergens as well as how they handle different diners. Multiple judges assess the entries and this leads to an initial shortlist. A selection of Venues are shortlisted and are then visited “Secret Shopper” style by judges before further deliberation happens. This year, I assessed the Creme de la Creme category and visited Olley’s Fish Experience in South London. I was so pleased with my visit and can confirm that they were awarded a GOLD award this year in the 2017 FreeFrom Eating Out Awards. I also visited the British Motor Museum (in Banbury) who were awarded a SILVER Award in the Cafes and Teashop Category. And a fellow Judge, who also writes a really great Blog (www.ForeverFreeFrom.com) has produced an amazing Map which locates all the 2017 Winners. This means you have a superb resource to check out the locations of the Winners as well as checking out the spread of establishments across the UK. The map (by Benjamin) above includes all venues that have received Free From Eating Out Awards from 2015 to 2017. The map was updated on 21 November to add 2017 Award Winners. You can zoom to your area. You can use the left side navigation panel to filter for Cafes, Fish & Chip Shops, Restaurants and B&Bs & Guest Houses. If you are using desktop hit the expand button top right to go to full screen. Descriptions for each marked venue indicate the type of Award received and offer a teaser of judge opinions. Bigger chain venues have their own category so you can filter them in or out as you prefer. Note that whilst many FreeFrom Eating Out Awards venues cater gluten free the Awards are not limited to gluten. Some venues even have menus with dishes free from all 14 major allergens. As ever you should still take care of yourself or family by ensuring that your personal needs are catered for before dining. Now, you have no excuses to enjoy a FreeFrom Eating Out establishment and a great GLUTEN FREE Meal! And remember, if you know of places which you believe to be Award Winning, You can contact the Awards team to recommend they invite the venue to enter or contact the venue itself to tell them why you think they should. They just might love the idea and welcome your encouragement! Entries for 2017 are closed but each year welcomes more and more venues. Great news for FreeFrom diners! Follow the FreeFrom Eating Out Awards on Facebook or Twitter to stay informed and get involved. And remember I love my Chocolate including Halloween 2017 as well as revised Chocolate Box guide (based upon Chocolatier Producers, Chocolate Boxes on the High Street and Luxurious Chocolate Boxes, Chocolate Bars, Chocolate Bags, my Chocolate Easter Eggs from Chocolatiers and Chocolate manufacturers, High Street Stores and London Department Stores and more recently, my Valentine Chocolates and Easter Eggs (covering Part 1: Chocolatiers and Chocolate Producers, Part 2: High Street Chocolate Eggs (including Asda, The Co-Operative Store, Holland & Barrett, M&S, Sainsburys, Tescos & Waitrose) and Part 3: Decadent Chocolate Eggs (for those luxurious consumers and extravagant chocolate lovers including Fortnum & Mason, Harrods and Selfridges). This information was correct as of DECEMBER 2017. Loved the crispiness of their batter and the generous portion of chips! 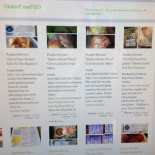 This entry was posted on December 8, 2017 by glutenfreepsd in News & Views, Travelling Gluten Free and tagged Eating Out Venues, FreeFrom Awards, FreeFrom Eating Out Awards, Gluten Free Map.